including some interiors shops, and the high street has the usual chain restaurants. In fact there's very little wrong with Chiswick and therein lies its problem: it is a bit dull. Which is why Chloe Lee's penthouse apartment comes as a pleasant surprise. You would expect to find the modernist loft building in urban Clerkenwell but not at the end of a Victorian terraced street in W4. 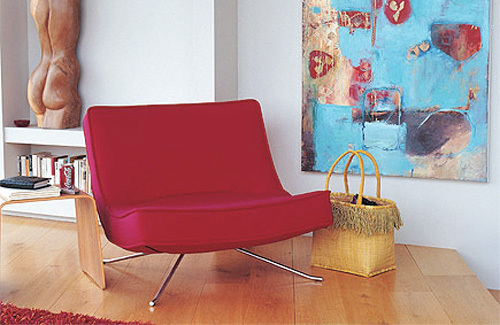 The Pop fireside chair by Christian Werner for Ligne Roset gives this open-plan living area a colourful 1960s vibe. The large painting was an inspired find at a local art fair. Once a factory, the apartments are made up of three buildings: two 1930s blocks and a new building constructed 10 years ago on the site of the original 1960s block. 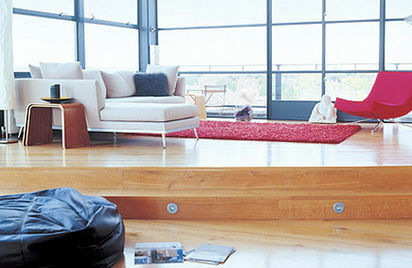 Chloe lives in the penthouse with her husband John, a one-time architect and current property developer, and their two children, Mia (8) and Jackson (11).